Mybodycalc offers you all the tools you will ever need to create your mirror body whilst staying healthy. We don't just want you to lose or gain weight, we want you to lose fat or build quality muscle depending on your ultimate goal. Our app is based on decades upon decades of Scientific and University Research unlike the majority of fad diets that are based solely on the Author's beliefs. You will hear some websites boast how you do not have to count calories and eat what you want, if you are reading this, you have already been doing that and are still looking for a solution you are happy with. We have that solution. Numbers make up everything in the Universe and it's no different when it comes down to getting your mirror body. Science has told us that our height, weight, age, gender and daily activity level, gives us an estimate of the amount of calories our body needs per day to function properly. It goes a step further and tells us how Protein, Carbohydrates and Fats these should be split down into. Finally dependant upon Age and Gender it gives us how much of each Vitamin and Mineral we should be taking daily in order to stay fit and healthy. We take the headache out of all this and do all the math for you. Science also tells us how many calories we can expect to burn during Cardio Exercise based on our Height, Weight, Age and Gender, again we do all the hard work here, all you have to do is find the exercise you have done from our database, enter the time spent and we do the rest. 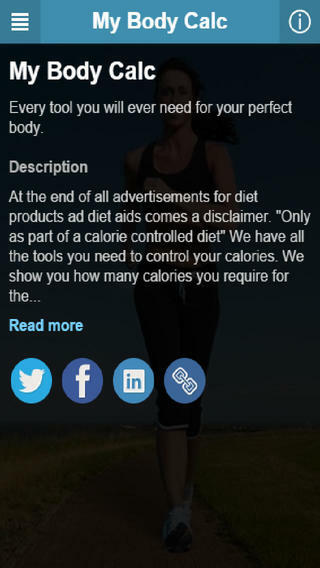 Our Features include.- Calorie Counter- Gym Diary- Cardio Diary- Extensive Reports- Online Social CommunitySimply put, Tell us your Height, Weight, D.O.B, Gender and Daily Activity Level and finally your ultimate goal....Tell us the foods you have eaten for the day + any exercise you have carried out.....keep an eye on your reports and as long as you are as close to your daily figures as possible, you will be well on track to get the body you want. We don't just want you to look good in clothes, we want you to look good naked.